my mixture of the Acoustical Systems tonearm Axiom and my Toho pipes/headshells- called ToXiom led me to the conclusion going for a complete Acoustical Systems tonearm some day. A new project (I may write later about it – modern DD-drive) allowed me to implement a 10 inch Aquilar tonearm. I used my AS mounting alignment tool to bring the arm into position – of course UNI-Din related. My Audio Technica ART 1000 cartridge was put into the Arche headshell pretty precisely, also setting VTA/ SRA via the Arche headshell into position. The result is stunning. It is not only an easy mounting tonearm of the modern kind. It is also a wonderful sounding instrument making me really happy. I do understand why the Aquilar won prizes in Japan and some other countries. I am guessing someone has purchased a the new Brinkmann Oasis? 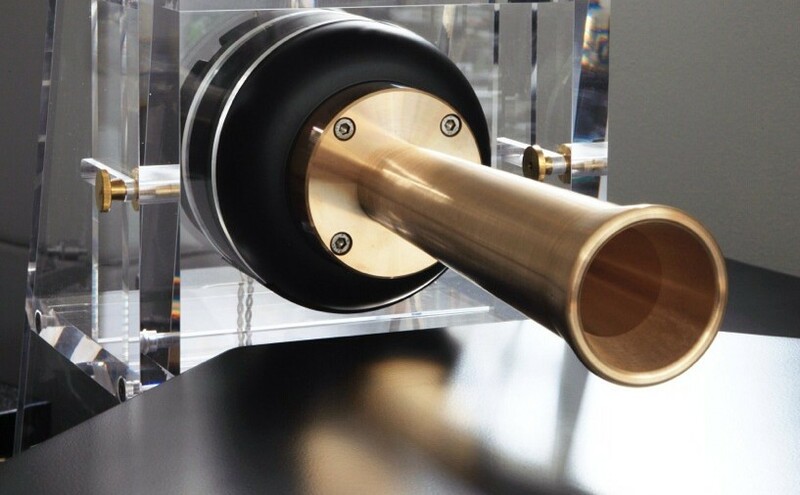 I have been reading about this turntable with its resonance-inhibiting aluminum, copper, magnesium platter. Did you get the optional glass platter mat? The set up looks fantastic! the glass mat is inbuilt. It is made from crystal glass and does optimise resonance control. On top of that I am using a very slim felt mat which is really good. Oh, I thought it was an option similar to the Nagaoka GL-602 crystal/glass turntable mat which is very good. Just wondering, is the Brinkmann to be used in your big system or the smaller one?